You can take a shower at SFO! 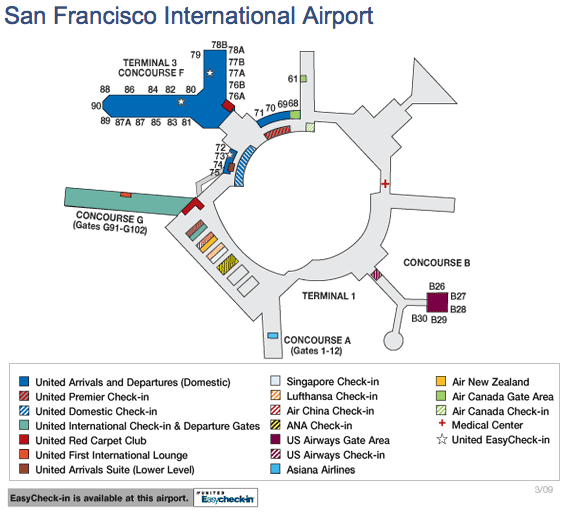 If ever you needed to freshen up at SFO, there’s a solution for you if you are Star Alliance Gold with an international itinerary. Around the corner from United’s Red Carpet Club (turn right after security in Concourse G), tucked away is Singapore Airline’s Silver Kris Lounge (Level 3), which you can get in if you are Star Alliance Gold and on an international itinerary. It’s a smaller, cozier lounge than the Red Carpet Club, but the Silver Kris Lounge has one amenity that the Red Carpet Club at SFO lacks: a shower facility. The shower facility is nothing fancy but it does the job. Towels are provided at the front desk and the shower facility has generic liquid soap, shampoo, and conditioner. So you don’t need to be equipped with anything. And for those with long hair, a blow dryer is also provided. In addition to having a shower facility, the Silver Kris Lounge has a better snack selection than the neighboring Red Carpet Club and it provides free alcoholic beverages ranging from bottle beers to Johnnie Walker whiskey (unfortunately it’s only Black Label). The only downside to this lounge is that it’s only open during odd hours, to coincide with Singapore Airlines flights. During daylight savings, the lounge is open from 10:40am to 2:20pm and then from 9:55pm to 1:25am. During Pacific Standard Time, it opens from 9am to 12:30pm and then from 8:35pm to 12:05pm. However, this schedule changes frequently during the year but the general blocks of time are the same.